Don’t be surprised if third or fourth party presidential candidates garner enough votes in November to make a difference in some of the hotly contested swing states. The polls show more than enough Republican disaffection with John McCain’s candidacy to make a case that Bob Barr, the Libertarian candidate, or another right-of-center candidate could take votes away from the GOP standard bearer. And on the Democratic side, Barack Obama has to worry about defections of not only Hillary Clinton’s supporters, but also of liberals, who are beginning to grumble that he is moving too much toward the center. The 2000 presidential election clearly showed that third-party candidates do not have to roll up big numbers to make a huge difference. Ralph Nader accumulated just 2% of the vote in Florida — and exit polls found that Al Gore was the second choice among most of Nader’s voters. While Democratic voters were never wildly enthusiastic about Gore during that campaign, the climate of opinion about John McCain is more fragile this year. Pew Research’s nationwide voter poll in late June revealed that significantly fewer McCain supporters than Obama supporters say they are strongly committed to their candidate. McCain engenders less commitment than George W. Bush enjoyed at this stage in his presidential campaigns. Indeed, the disparity in strong support for the two candidates this year is the largest measured in the last two decades. Among supporters of each candidate, almost twice as many describe themselves as strong Obama backers compared with McCain backers (58% vs. 34%). McCain’s standing is in stark contrast to the support for Bush four years ago, when the vast majority of Bush voters (71%) said they backed him strongly. In June 2000, committed Bush backers constituted only 44% of his support, but this was significantly more than McCain now registers. 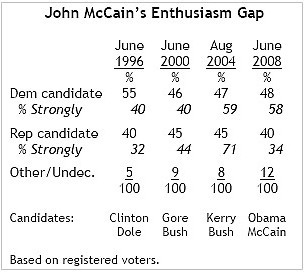 You have to go back to Bob Dole in 1996 to match the current lack of enthusiasm for John McCain. Read the full commentary at nytimes.com.